today we are going way back in the patternsphere – pre written pattern, to be exact. alternately, your hand must be smaller than mine which are women’s large – measuring 7.5 in. around and 5 in. from where my thumb starts to the top of my longest finger. i tried. i wore them to work twice when it was very cold outside. they work well and they are super fuzzy (mohair and angora – yum!). i could put them in the gift pile, but frankly, they need to be worn! that’s what i get for just wanting to do a pattern and not making them for myself – OF COURSE i would want to wear them later. silly. what better way to let them go than let them warm another knitter who will appreciate and love them? the color in this picture is closest to true- the hand dyed is pretty sassy. click on the word ‘mitts’ above to see other pics and other specs. comment if you’d like the chance to win them! have a great weekend. i’ll be back on monday with the winners of all five prizes. if you haven’t entered any yet, feel free. they’re contained in this entry and the four before. all you have to do is comment on the ones you’re keen on. thanks for taking part in my blogiversary! This entry was posted in contest, free, knitting, mittens by cosymakes. Bookmark the permalink. I have wee hands – certainly compared to yours. Put my name in the hat as well too, please! Those are so pretty! And I have small enough hands to wear them! You can throw my name in the hat. projects. I have made several of your hats for a local hospital to give to those patients who need them. Thanks for the patterns. OMG, I love those! I’ve been looking for a pattern for making a pair of mitts just like them too. I have small hands and think those would fit me perfect. I hope *crossing fingers* that I win those!! What a shame! I have big hands too, so you’d better not put me in the draw. I just had to say how stunning these are, but I’m sure you know that already! Love your work. Those mittens are beautiful!!! Please put my name in the drawing, I have tiny hands and I need lots of mittens because I live in Alaska! OHHHHH.bEAUTIFUL. I have small enough hands for something as wonderful as hand-made gorgeous mitts! Throw me in too…if you will. I love the colorwork on those, and the variegation of the hand dyed yarn. They would fit me too! the sabbath mitts… I don’t know if they would fit, my hands are likely a large too (couldn’t find a tape measure in this chaos I call home).. but the joy of having snug fitting sabbath mitts… it would surpass any fit issues. Wow. This feels like some kind of Nordic Cinderella moment. If we were all to line up and try them on, I suppose my fingers would be too long. But maybe, just maybe… The beasts of the field will give of their wool, and you will be my fairy godmother. These would keep my little hands warm during this cold Nova Scotia winter. I love everything you make and I envy your sense of color matching. they are beautiful and they would fit beautifully I believe! Happy blogiversary! And anniversary, too! Hubby and I hit our 6-year mark in July…here’s to many more happy years for both of us! I’d love the mittens – I haven’t tried my hand (ha ha!) 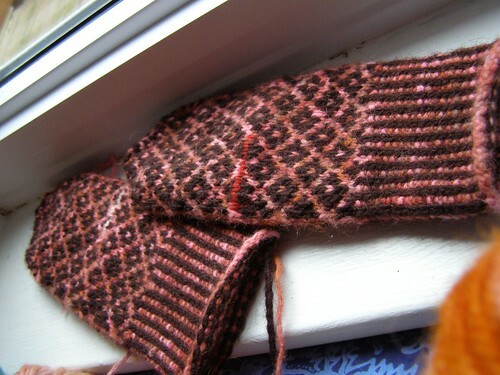 at mittens like this yet (do have Eunny’s Anemoi mitts on hold indefinitely while I figure out the chart). Love the color combination, and they’d fit me! Lovely!!! Oh…those are so beautiful! I think my hand would probably fit them…they might be a touch big. Would you please add my name to the hat? Finally, something good about having little hands!! I’d love to win this pair of gorgeous mittens! I feel your pain, I’ve knit mittens that turned out too small for me, too – gauge issues, grrrr – but at least I have grandchildren with even smaller hands than mine. Thank you for your generosity, and happy blogiversary! I pulled out the measuring tape, and couldn’t believe it when I saw that these mittens would fit me, so please put my name in the draw! Happy blogiversary again! How wonderful you made those amazing mittens to fit my hands and you didn’t even know I needed some. They are beautiful!